East Texas has some of the most beautiful lakes in Texas, largely because they are surrounded by lavish forests. If anyone ever asks me to pick the lake I like most, Caddo Lake, located near Jefferson, would be high on my list, largely because its mystical nature is captivating. Caddo is among the few naturally formed lakes in Texas. It was created in the 1800s when the backwaters of the Red River broke though a logjam, eventually sprawling over more than 26,000 acres along the Texas-Louisiana border with water. 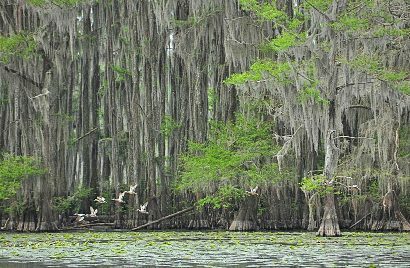 What makes Caddo so different is its large cypress trees. Their roots, called knees, poke out of the water like gnomes. 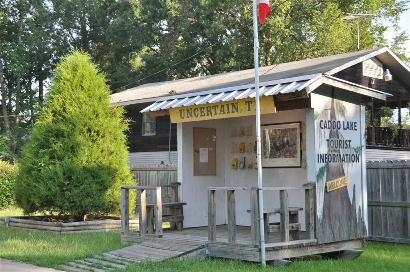 "What makes Caddo so different is its large cypress trees." The lake is also rich in wildlife. The lake�s alligators are shy, but if you look closely you�ll find them swimming lazily between the cypress trees, sometimes with birds riding on their backs. You�ll also find opossums, all kind of snakes and scorpions, egrets, blue herons, beavers, deer, raccoons, bobcats and coyotes. And in the trees, barred owls seem to call out with a low-pitched sound that sounds like, �Who cooks for you?" 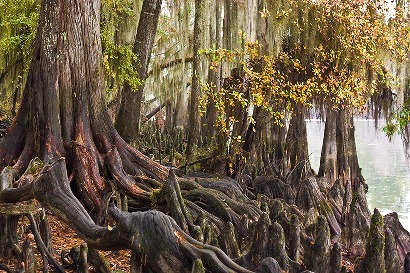 The cypress trees are home to a Spanish moss, which isn�t a moss at all, but related to the pineapple, a guide told us. Spending the night on the lake is an experience of its own. The best place is one of nine stone and log rental cabins built in 1934 by the Civilian Conservation Corps. Guides carry tourists through the swamp with �Go-Devil� boats, a low-profile metal craft with an outboard motor that can navigate the shallow waters with ease. One Go-Devil guide often tells his passengers, �A lot of people get lost here and have to spend the night without wanting too,� while patting the metal storage bin on his boat, which is always packed with tins of sardines and Vienna sausages. If you want more comfort for your boat ride, larger boats, some shaped like old steamboats, often carry groups of sightseers across the lake, weaving among the old cypress trees. Adding to the mystery of the lake are several sightings of Bigfoot, the large man-like creature which has been seen by visitors on several occasions. Bob Bowman's East Texas May 22, 2011 Column.